Every organization is under pressure to drive success for shareholders, stakeholders and owners. Organizations retreat to their comfort zones when challenged with achieving higher levels of success. Frequently, this results in controlling the bottom line. Continuous improvement can be used to enable top-line growth. Figure 1 shows a compelling reason to focus on improving your position through growth rather than controlling cost. If you choose to focus on the bottom line, you can reduce costs for your organization. However, reducing cost has a solid bottom. More importantly, as you focus inward, you lose focus on the customer which may lead to missed opportunities. On the other hand, if you focus on driving the top line, you will not experience a limit to the potential and you will be focused on the customer and the market. This better enables you to be a partner and react to changes in their needs. Your organization is under pressure to improve profitability. The team chooses to explore a few potential options. They may be efficiency related, yield related, headcount related, etc. ; they typically are all related to cost. Some teams may include revenue or EBITDA (earnings before interest, taxes, depreciation and amortization). Any of these measures may be important to understand and measure, but may not be the best indicators for measuring your ability to add value to the customers nor to react to changing market demands. It is best to learn specific products and services valued in existing and adjacent markets. This requires speaking directly with existing customers, potential customers, customers you have lost as well as performing market research through benchmarking. Think of customer focus as a micro-view which is required to stay in business and market/adjacent market studies as macro-view. Winning at both enables growing organically. Handpicked Content : Should All Black Belts be Green Belt Teachers? Then build a strategy to add value to develop a competitive advantage. Focusing on value can be used as a competitive advantage. This approach leverages all teams and aligns their actions to the customer. For this chart to be meaningful, you must know what functions of your product are valued by the customer. 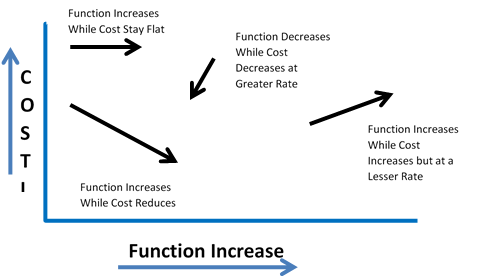 Function increases while costs stay flat: If you add market desired functions while keeping cost equal, the market will view this as improved value. Function increases while costs increase but to a lesser degree: If a function is highly desirable in the market, customers may be willing to pay an upcharge and still consider this as a value increase. 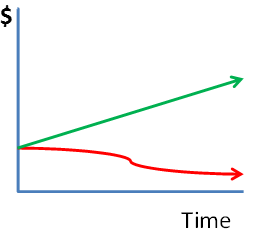 Function decreases while costs decrease at a greater rate: This is important if you have an over-engineered product or service. It is possible to improve value to the customer by reducing cost through eliminating functions not needed by the market. As shown in Figure 2, organizational leadership has many options to consider in setting strategy. With limits to time, talent and treasure, it is important to utilize evaluation processes to provide the best chance of success. A few options are shown here to highlight how each choice also requires a choice for alignment of resources. Commit to value-driven innovation and execution as a strategy. Commit to your preferred market position. Review Steps 2 and 3. They are full of “vs.” Are you sure being in established markets prohibit winning in emerging markets? Are you sure you cannot be top end and economy simultaneously? Review the plan against your organization’s core competencies. Do you have the talent to achieve this strategy? Establish the metrics you will need for each decision to assure you are measuring progress to your strategy. Do not select a metric based upon ease of data or current system restrictions. Define your metrics to be meaningful. This approach enables leadership to set strategies which engage multiple teams to unlock their synergies. With all teams working together to drive improvements through cross-functional collaboration, you will earn the right to grow your top line.